Today’s #VeteranOfTheDay is Army Veteran Bleysin Collier Welch. Bleysin served from 2001-2003. 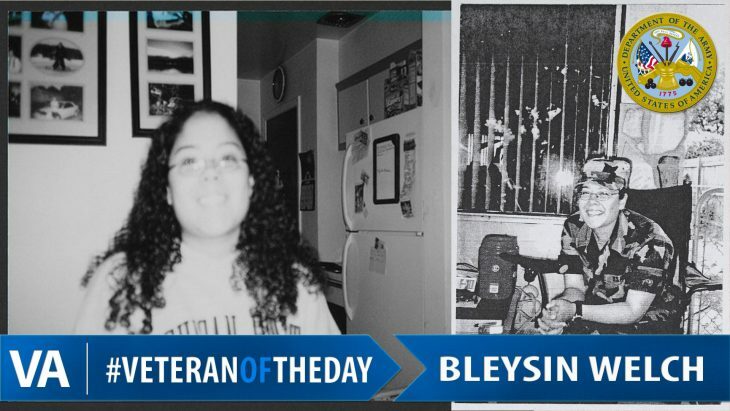 As the daughter of an Airborne Infantryman, Bleysin had grown up on Army bases and was already well-acquainted with Army life before graduating high school and enlisting in 2001. Following her enlistment, Bleysin received six weeks of basic training at Fort Jackson, South Carolina. After completing basic training, Bleysin received Advanced Individual Training at Fort Lee, Virginia. After completing her training, Bleysin was assigned as a unit supply specialist and was attached to the 10th Combat Support Hospital at Fort Carson, Colorado. During her service, Bleysin served as a liaison officer facilitating logistical communication between the 10th CSH in Fort Carson and the 10th CHS in Iraq and Afghanistan. Bleysin also participated in training missions at the Joint Readiness Training Center in Fort Polk, Louisiana. Bleysin was discharged in 2003 at the rank of specialist due to a back injury sustained during her service. Thank you for your service, Bleysin!